Home Entertainment The Harvey Family – How Many Kids Does Steve Harvey Actually Have? The Harvey Family – How Many Kids Does Steve Harvey Actually Have? Steve Harvey, known for such shows like “The Steve Harvey Show” and “Family Feud,” has a very large family. Most people do not actually know that he has no less than seven children. When you hear that he married three times in his lifetime it is no wonder that he has managed to father so many kids. Steve Harvey is an American actor, first and foremost, but he came to prominence by being a day time TV host. He is most notable for his long-running show “The Steve Harvey Show” which came into prominence during the 90s. But Steve garnered even more success with the game show “Family Feud.” He is notoriously famous by his dry humor and reactions to wrong answers that people give during the show. You probably know some viral videos that depict him throwing it in to people who give wrong answers or making fun of those who give up even when they have a correct answer. Most recently, Steve has been honored by all of his kids during his show and his current wife Marjorie. Let’s name them all and see what makes them additionally famous except being the children of Steve Harvey. Marcia Harvey was Steve’s first wife to whom he was married from 1982 to 1994 and the two of them had three kids together. The oldest of Steve’s kids are twins Karli and Brandi, born in 1982. Karli Harvey-Raymond is a fitness instructor and a female empowerment activist. She runs a group with her twin sister Karli and gives all women a voice. She is a regular at her father’s show and has made multiple appearances already. Karli is married to Ben Raymond and the couple was blessed with their first child in 2016. The second twin, Brandi Harvey, runs the female empowerment group called Young, Fit & Fly with her sister. Her main focus is to help underprivileged children and give them a voice and better lives. Broderick Harvey, Jr. is Harvey’s first born son and the third child from his marriage to Marcia Harvey. He was born in 1991 but tends to stay out of the spotlight. He runs a successful shoe store and tries to make his own name away from his famous father. His most notable live appearance was on Family Feud when the Harvey boys were pitted against the Harvey sisters in an ultimate showdown. Steve Harvey’s second wife was Marry Lee Harvey. This relationship also ended up with a divorce but the two managed to have one child together. In July 1997, Wynton Harvey was born. Wynton Harvey is Steve’s second son and perhaps the one who has the most resemblance to his famous father. He has stated multiple times that he views his father as his personal idol and does not shy away from the limelight. Wynton made multiple appearances as a co-host on “Steve” and can be seen in most of the clips on Steve’s personal YouTube channel. Privately, Wynton works as a model and is into photography. 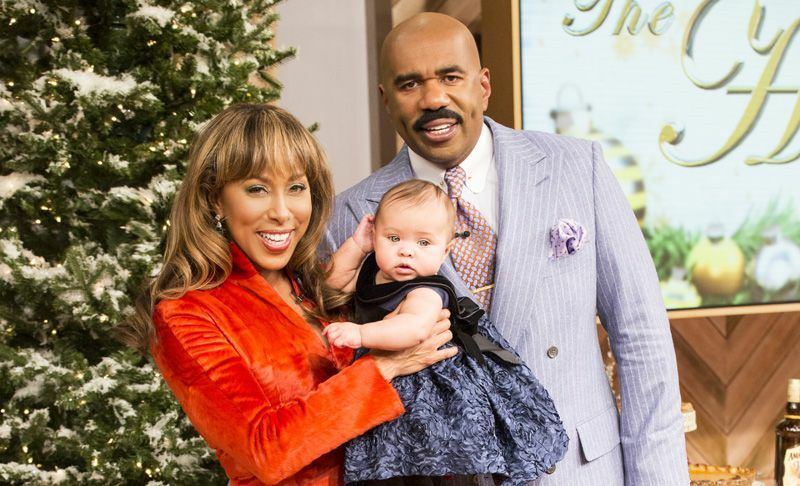 Steve Harvey and Marjorie Harvey do not have any biological kids of their own. Instead, Harvey agreed to father all three kids from Marjorie’s previous marriage as his own. All three of them have taken the Harvey surname and view Steve as their rightful father. Morgan Harvey-Hawthorne is the oldest step-daughter of Steve Harvey. Morgan runs her own food blog, titled “Give Me Some Mo,” and is very successful with it. Morgan is married to Kareem Hawthorne with whom she has one child. Lori Harvey is the middle child of Marjorie Harvey and Steve Harvey. She is probably the most beautiful one of the bunch and works as a model. She decided to follow the same path as her mother and is already signed to some very famous model brands, LA Models and Select Model Management being just some of them. Lori was born in 1997 and is still not married. Although she had been engaged to Memphis Depay, a Dutch soccer player formerly of Manchester United, but their relationship and engagement eventually fell through. Jason Harvey is the youngest step-son of Steve Harvey and also the youngest of all of his children. Jason is a successful businessman and the founder of a prominent women’s footwear company called Yevrah. Besides being a successful businessman, he also has a big family. Jason and his wife Amanda Harvey have three children together, with the latest, Ezra, being born in 2015.